The Georgia Breast Cancer Coalition had a great and productive meeting at DeKalb Medical on Monday. The meeting centered on what GABCC could do to help breast cancer patients at DeKalb Medical. 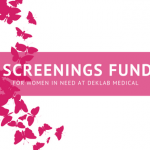 DeKalb Medical expressed that they have 10 women from their October screening that need an ultrasound follow up. GABCC has committed to paying for these 10 ultrasounds. In addition, GABCC is looking into the opportunity to fund a much-needed biopsy for a DeKalb Medical breast cancer patient. GABCC is thrilled to partner with this incredible medical institution to serve Breast Cancer Patients in Georgia.